Posted on Fri, Jan 27, 2012 : 5:58 a.m.
Tim Mayleben, CEO of Aastrom Biosciences, and wife Dawn funded a program at the University of Michigan Zell Lurie Institute for Entrepreneurial Studies to help students evaluate business ideas. A new endowment program funded by a successful Ann Arbor entrepreneur aims to help students at the University of Michigan bridge the gap between early ideas and feasible businesses capable of attracting investment capital. The Samuel Zell and Robert H. Lurie Institute for Entrepreneurial Studies at U-M's Ross School of Business is launching the Mayleben Family Venture Shaping Program. 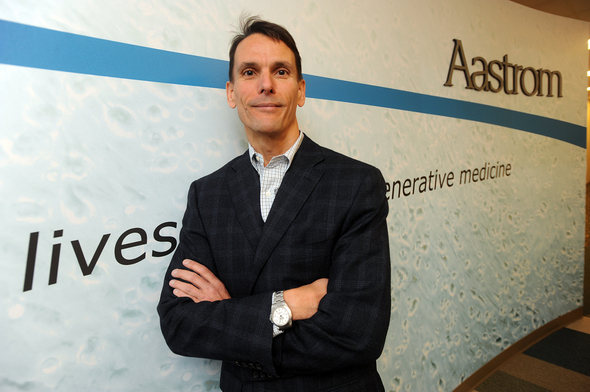 The program is named after Tim Mayleben, CEO of biotech firm Aastrom Biosciences and former chief operating officer of the first Esperion Therapeutics, and his wife Dawn, who serves as administration and financial affairs manager at U-M’s Erb Institute. The program, which is not limited to business students, is designed as a semester-long, three-part process to evaluate a business idea based on market need and its commercial potential. Officials would not disclose the amount of the endowment gift, which was intended to fund the program in perpetuity. Under the program, 25 teams will be selected from a pool of applicants and given cash prizes to conduct feasibility and other studies to prepare the businesses for launch. It’s envisioned as a bridge between the 1000 Pitches competition and the twice-annual Dare to Dream competition, which awards grant funding for the most promising business ideas. “There’s this gap between ‘I have this cool idea,’ which is not a business, but it’s a cool idea, it’s a kernel of a business, but how do you transfer into the framework of a business which you could then go do a feasibility study on to see if it’s worth doing?” said Tim Faley, managing director of the Zell Lurie Institute. The program comes as entrepreneurship appears to be on the rise in Ann Arbor in general and at U-M in particular. After years of prodding, university officials recently announced plans to invest up to $25 million from its endowment in its own startup companies. And TechArb, the university’s startup business accelerator for students, is seeing record-high numbers of student entrepreneurs moving in. Faley said he began teaching a course on the topic of venture shaping in 2008 but needed funding to continue. Meanwhile Mayleben, a Ross MBA graduate who served with Faley on the Wolverine Venture Fund advisory board, had approached the school about wanting to make a gift. “Most of my professional life has been spent working in entrepreneurial, innovative businesses,” Mayleben said. “I understand the challenges that students, entrepreneurs, and in particular, student entrepreneurs, face when trying to turn an idea into a successful business. Faley said the program will help student entrepreneurs focus on clearly defining their business and articulating their commercial feasibility. CORRECTION: This story was updated to reflect that Mayleben was chief operating officer at the first Esperion Therapeutics, not a co-founder.